Easy to make and so much tastier than the supermarket stuff! 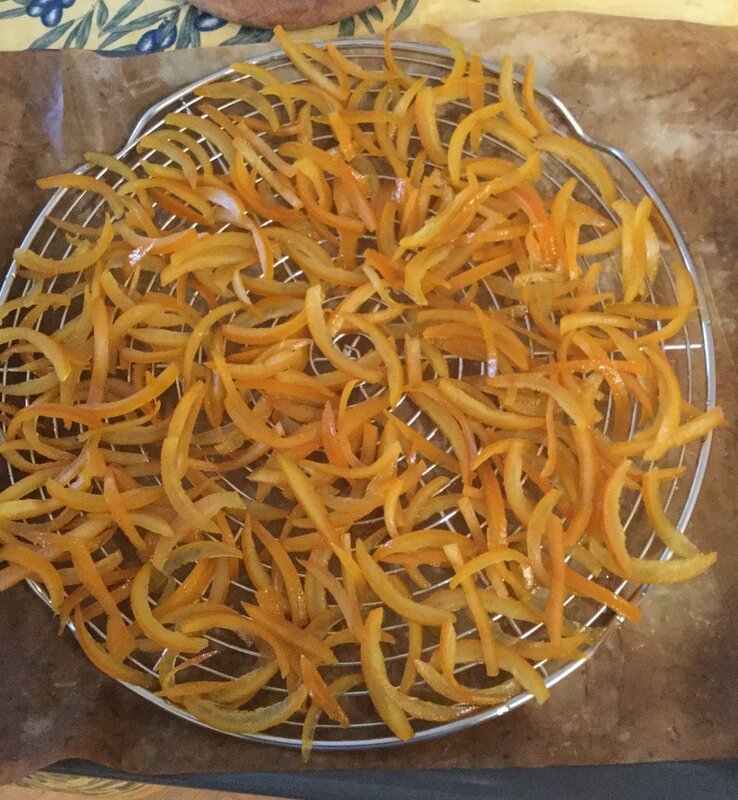 These are really easy to make–don’t let the long prep time frighten you off, it’s basically drying time for the peels, so you just have to leave them out on a kitchen counter somewhere. Cut off a bottom and top slice of each orange so that you can easily stand them on a chopping board. With a sharp pairing knife, separate the zest & the pith from the oranges (it's ok if some pulp remains on the pith). Cut the peels into thin strips. Put the strips into a saucepan, cover with water, bring to a boil, and discard the water. Repeat twice: this removes the bitterness of the pith. Then weigh the blanched strips. Put them back in the (cleaned) saucepan, cover with water, and add an amount of sugar of equal weight to that of the blanched strips. Bring to a boil, and reduce until you get to a medium simmer (the goal is to get the syrup to reduce, but over a long time so you don't want too *much* simmer). Keep this going for 1h-1h30, or until the syrup forms little bubbles around the strips (mine were in 1h and it was plenty of time!). Leave the peels to cool in the syrup for 20-25min. Then set them to dry on a rack over baking parchment (you want parchment paper because you're going to get sugar dripping down and it's extremely annoying to clean off, say, a kitchen counter...). Leave to dry for 24 hours. or b. coat in melted chocolate for orangettes (set the chocolate to bain-marie to melt it without burning it, and get it liquid enough that it'll coat easily. I screwed up that step and my orangettes look horrible. However, they still taste good). Once coated in chocolate, set aside on baking parchment so that the chocolate covering sets (around 1-2 hours). Store in airtight containers for up to 6 months.